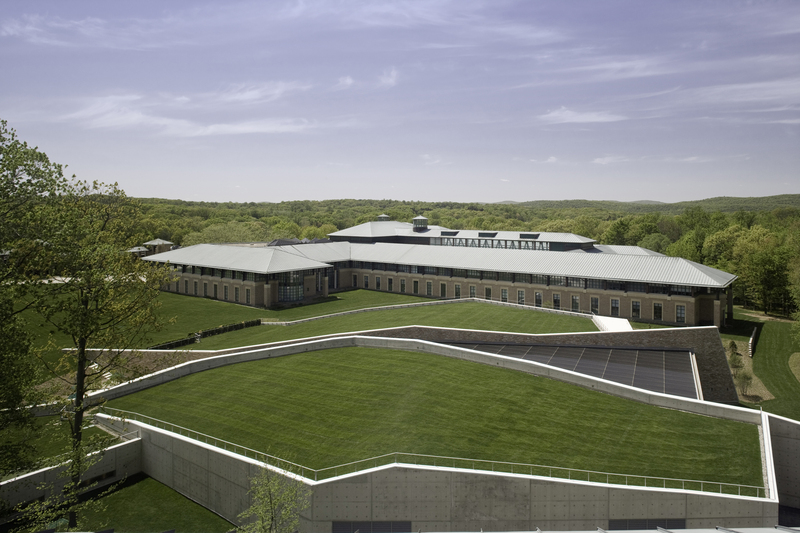 Great Lawn and Roof of BD Campus Center. Photo by Brad Feinknopf. SLIP/SCAPE is a hybrid construct that bridges and blurs boundaries between building/landscape, indoor/outdoor, roof/earth, figure/ground, and the two local cultures of management/production. It is a place of collaboration and nourishment, where knowledge workers commune with themselves and one another. SLIP/SCAPE operates within a void, a constructed Lawn between two existing buildings on the site. This venerated territory, like all of the interior atria of the existing buildings, is manicured, heavily curated, sanitized, and controlled. These spaces are not used for occupation or gathering, but instead are spaces of absence, always viewed from a distance. SLIP/SCAPE subverts this by occupying the Lawn and transforming the roles of subject (the user/viewer) and object (the void). It also challenges the classical figure/ground relationships of the existing campus. SLIP/SCAPE introduces ambiguity into an aseptic site. SLIP/SCAPE reconstructs the inviolate Lawn, sloping and folding it upward to become roof and allowing for program to occur within and beneath it. The formal language offers employees an escape from their regimented schedules and ordered world of cubicles and offices. SLIP/SCAPE transcends the rigid geometries and repetitive/modular DNA of the existing facilities. As traces of the footprints of the two existing buildings are interpolated and layered onto the site, SLIP/SCAPE forms a new composite geometry. SLIP/SCAPE is non-hierarchical, non-linear, non-scalar, multi-directional, discontinuous, and fluid–creating a new interior organizational freedom that allows for unexpected intersections between occupants. Deployed as a conceptual tool and design strategy, SLIP/SCAPE is a movement, displacement, and misalignment of surfaces and planes that makes visible, celebrates, activates, and occupies the resultant voids. Two site walls rise from the Lawn, sheltering an outdoor terrace and bisecting the structure into two volumes. The interior spatial void undulates and swells as the walls tempt intersection only to part and open the space outwards, framing an expansive view towards existing woodlands to the north. This cut allows light to penetrate deep into the building. It is a space of dual readings–bifurcation and overlap of spaces, both interior and exterior. SLIP/SCAPE displaces two existing dining facilities, creating a new terrain with a multiplicity of dining venues, servery options, commercial kitchen, retail spaces, coffee bar and café, bank, dry cleaner, and support areas including a loading dock and mezzanine-level mechanical areas. There are exterior dining terraces, and areas within the building that can be partitioned into more intimate dining/meeting areas. Cast-in-place concrete is the principal building material primarily for its conceptual relation to the earth, its status as an aggregate of several materials combined to form a unified composite material, and for its organic yet constructed nature. Horizontal layers of natural stone create strata that recall the layered earth. Inside, sloped and skewed steel columns are paired with illuminated light clusters that allow the roof to slip weightlessly overhead. SLIP/SCAPE is equalized territory. It is a living hybrid morphology of the intentional and the organic. Floor Plan. Image by Bradley Walters. BD Campus Center. Photo by Brad Feinknopf. Owner: Becton, Dickinson and Company | www.bd.com. Client Team: Karen Kinney, Project Manager; Michael Diker, Tony Albanese, Don Sposato, and Liz Fichtel. Architect: RMJM (formerly Hillier Architecture), 500 Alexander Park, Princeton, NJ 08543-6395, Tel. 609.452.8888 | Fax. 609.452.8332 | www.rmjm.com. Design Team: Barbara A. Hillier, Principal-in-Charge + Lead Designer; Bradley Walters: Designer + Project Manager; José Atienza, Project Designer; Margaret “Peggy” Kehrer, Project Architect; Michael Levin, Senior Technical Architect; George Swallow, Jennifer Akerman, Philip M. Donovan, Brenda Nyce-Taylor (Furniture), Janet Garwood (Landscape), Despina Raggousis (Signage), Ernie Hunt, Evan Yassky, and Martin Bloomenthal. Mechanical / Electrical / Plumbing / Fire Protection Engineers: AKF Engineers, LLP | www.akf-engineers.com. Rudy Frank, Project Manager. Audio / Visual, Tele / Data, & Security: Walter Cooper, AKF Technologies, LLC | www.akf-engineers.com. Hill, John. “AE14: Earth Berms, 21st-Century Style,” Archidose. 21 June 2009. http://archidose.blogspot.com/2009/06/ae14-earth-berms-21st-century-style.html (accessed: 3 July 2009). “New American Architecture,” curated and organized by Christian K. Narkiewicz-Laine, Director/President, The Chicago Athenaeum and assisted by Lary L. Sommers, Director of Administration/Marketing, The Chicago Athenaeum, and Kieran Conlon, Director/COO, The European Centre for Architecture, Art, Design and Urban Studies, Dublin. SESV Santa Verdiana (piazza Lorenzo Ghiberti 27), Florence, Italy. Organized by the Municipality of Florence and the Faculty of Architecture in Florence. November, 2008. Currey, Mason. “Garden State: A New Jersey-based medical-technology company unites under a green roof.” Metropolis Magazine. 19 November 2008. Saywell, James, Ed. “BD Campus Center.” Hinge: Design in Focus. Hong Kong. Volume 141, April 2007, p. 48. Mathis, Mike. “Shades of Green,” Princeton Business Journal. 10 January 2006. Quinlan, Brian. “Reaping the Benefits of Being Green,” NJBiz. 9 January 2006.